Meagan Young ('12) double-majored in Civil Engineering and Archaeology with a minor in Classics. During the summer of 2011, she traveled to Greece to participate in the Nemea Field School through the University of California at Berkeley. Meagan completed an honors thesis during her senior year of undergraduate study on the shifts of architectural patterns at Nemea through the Archaic and Classical periods. Condition: Restored. Square vent hole cut on the back. 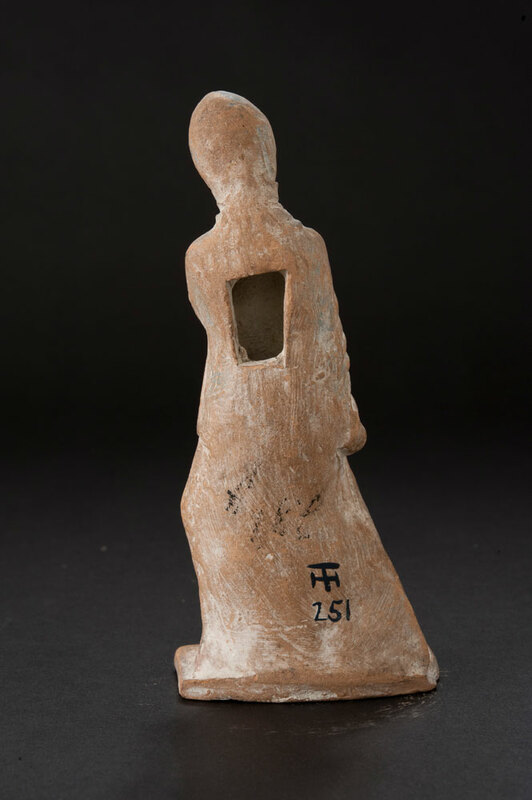 This small terracotta figurine is clothed in a way that makes her either a bride or a dancer. Her movement indicates that she may be a dancer, while her layered and hooded clothing indicates that she may be a bride as well. Looking to the right, her right hand rests on her side, while her left clutches a fold of fabric. 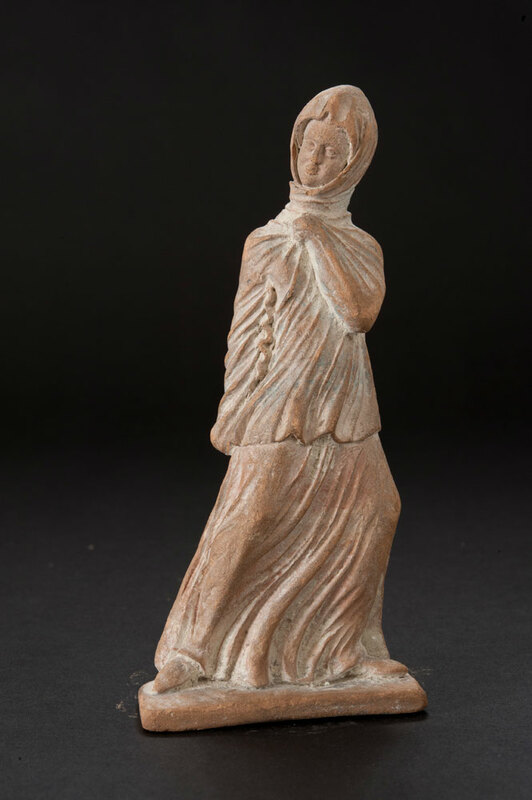 These terracotta statuettes were often used as votive offerings in religious and funerary contexts. But they were also enjoyed as domestic decorative objects, and, in some cases, even served as children’s toys. Earlier figurines from the Archaic and Classical periods typically represent deities, but later statuettes usually depict scenes from daily life. Those from the Hellenistic period offer realistic portrayals of contemporary individuals, and thus serve as important records of ancient fashion trends and hairstyles. Most Hellenistic terracotta figurines depict elegantly dressed women, often shown in a standing pose. Other frequently found iconographic types are the so-called “piggy-back girls” and the “knucklebone player”. Almost immediately after they were first discovered, Tanagra figurines became a major fad in nineteenth-century Europe. The demand for these figurines attracted skilled (and not-so-skilled) individuals to create similar pieces for profit. Some nineteenth-century figurines combined genuine Greek handiwork and modern attachments. Others were entirely fabricated in the modern era. These modern replicas and reworked pieces can make identifying genuine Hellenistic figurines somewhat difficult. One way in which scholars often differentiate genuine Hellenistic terracottas from later replicas is through a close study of the way in which fabric is represented. Greek artists took special care in their depictions of fabric. For example, on the “Standing Draped Woman” in the Metropolitan Museum of Art, the way her garments fall over her body mimics how real fabric would fold over a real human body. This is not so with the bride-dancer of the JHUAM collection. Although the Hopkins bride-dancer is shown in motion, the folds of her garments are exaggerated and excessively creased in a way that is not typical of ancient Greek figurines. The folds of the fabric are incredibly intricate, and there are many more present here than would be seen on an ancient Greek terracotta. This figurine’s surface decoration, especially the amount of paint preserved on it, is also telling. Large amounts of paint typically suggest a modern date of manufacture. The paints used by the Greeks were derived from a variety of naturally occurring materials, and they typically do not maintain such bright tones over a long period of time. Modern terracotta figures can, then, be identified by their exaggerated fabric folds and the vivid color of their surface decoration. Moreover, the facial features of modern figurines are typically very flat with the eyes cut into narrow slits. Although the JHUAM figurine imitates a very popular type of bride-dancer in ancient Greek sculpture, her face is indeed very flat and the clothing on her right arm does not fall naturally. It is, then, very likely that she is a nineteenth-century creation. Ammerman, Rebecca. “Tanagra Figurines.” Lecture. Higgins, Reynold Alleyne. Tanagra and the Figurines.